Accuracy and diagnostic functions for maximum industrial productivity. The new Fluke 87V has improved measurement functions, trouble-shooting features, resolution and accuracy to solve more problems on motor drives, in plant automation, power distribution and electro-mechanical equipment. The Fluke 87 Series V digital multimeter has a lifetime warranty and includes TL75 test leads, AC72 Alligator Clips, Holster, 9V battery (installed), Getting Started Manual, and CD with detailed manual. 87V includes an 80BK temperature probe. The new 80 series V are independently tested to comply with the 2nd edition of ANSI/ISA S82.01 and EN61010-1 CAT IV 600V/CAT III 1000V. They can withstand impulses in excess of 8,000 V and reduce risks related to surges and spikes. 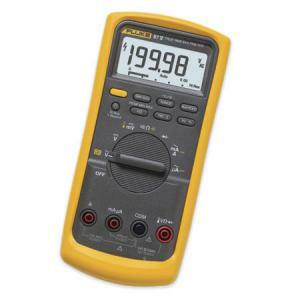 NIST Traceable Calibration Certificate for Fluke 87-V and 189 Digital Multimeters are available for $100 per Calibration Certificate, call 800-284-0808 to order. Description: Soft-Zippered Vinyl Case accommodates all Fluke 11x, 70 series, 787 and 80 series multimeters. Dimensions: 8.5" x 4.7" x 2.5"